Non-believers can find plenty to gripe about during Ramazan: getting woken up at 2 a.m. every night for a month by loud, tuneless drummers; having your already-nearly-impossible-to-catch evening serviş bus moved up by half an hour to make sure the observant get home in time for iftar; and feeling guilty about drinking water in the midday heat while your neighbors refrain from letting anything pass their lips in the same 90-degree weather that has you dying for a beer. Oh, and the occasional yabancı friend getting hit on the head with a bottle for imbibing during the holy month. But at certain moments, the beauty, rather than the bother, of the occasion comes to the fore. Saturday night was one of those times. A slight breeze had picked up as I walked with a pair of friends down through our neighborhood to the main road. As dusk rapidly fell, tables were being set up on sidewalks and in alleys for people to break their fasts, whether with a multi-course meal or a humble serving of lahmacun. Some people already sat in front of their plates, patiently waiting for the sunset call to prayer that signals an end to the day's abstention. (Full disclosure: We did also witness a near-brawl at the local butcher shop that may or may not have been Ramadan-related.) The ezan began to echo out from the mosques as we hopped on the tram, and by the time we got off a few stops later, the mahyas were glowing in between the minarets and the streets were full of people eating and socializing happily. That night was also the kickoff of "Ramazanda Caz" (Jazz in Ramadan), a series of concerts by Muslim musicians, and about as religious of an experience as I'm likely to have. 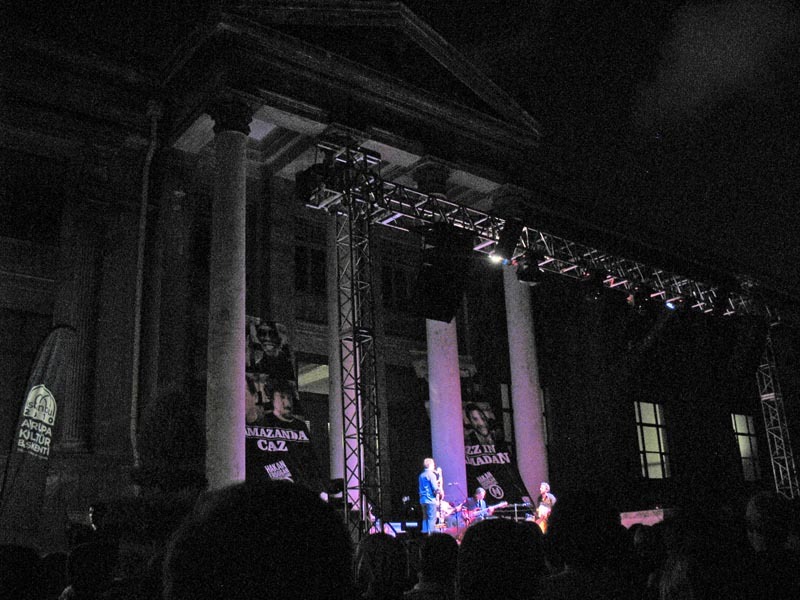 The atmosphere was indeed reverential as Tunisian oud master Anouar Brahem and his quartet played their lovely, melancholy mix of Arab classical music, Mediterranean/Persian/Indian melodies, and, of course, jazz, under the soaring, moodily lit neo-Greek columns of the Istanbul Archaeology Museum. Fireworks, football chants, and the final ezan of the night blended with the music as the leaves fluttered ever so slightly overhead. The beauty, community, and sense of peace seemed to exemplify some kind of Ramadan spirit, which wasn't even entirely dispelled by the taxi driver who tried to rip us off on our way home.